The main reason for writing a visa invitation letter is to apply a visa for a particular country. Accepting a visa application depends on whether you meet the terms of the country immigration law. You should write the letter in good faith. You must be honest with your facts that you are writing in the letter. This invitation letters include lots of information like, complete name, date of birth, address and telephone number, job title ,where the person will stay and how he or she will manage to pay for things and when the person plans to leave the country. The letter should have specific and detailed information. This should be a personal document not a professional one. One should have clear purpose of the planned visit including the name of the places you would be visiting. Also, it should mention about your arrangements you have made for staying or accommodation. Templates for the Visa Invitation Letter can be downloaded right here for your convenience in word and PDF format. 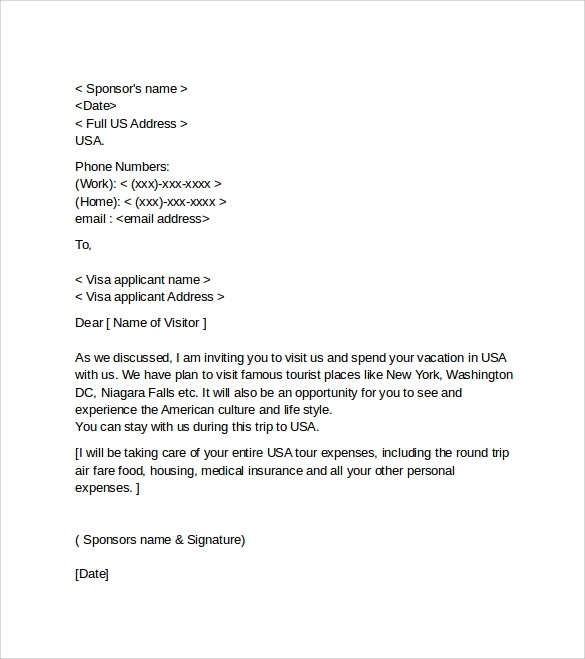 You may like invitation letters for US visa. This is an invitation letter for visa that comes from one’s company to that person, usually as a greeting. Just like any other official letter, it consists of the person’s name and address along with the body of the letter inviting the person for applying for visa, followed by the name of the sender& date.You may also see welcome letters. The body of these invitation letters specifies the purpose of invitation. It may be attending any event hosted by the company or an organization or it may be for any other official purpose. The body of the letter is usually divided in two to three paragraphs followed by a small conclusion.You may also see business letters. Why Do You Need Invitation Letters for Visa? Invitation letters for visa are for business purposes sent by companies to their employees. They are also sent by a person to a family member. Visas are important to get access to a different country. The letters are also to let one know regarding the purpose of invitation to one’s country. You may like business meeting invitation letters. Invitation letters for visa are usually written in official format. It is mostly written on a white page in legible black fonts. On the left hand side, the name of the applicant along with his or her address is written followed by the invitation and name of the sender.You may also see free letters. How To Write invitation letter for Visa? What are the Key Points to Note While Writing an Invitation Letter for Visa?